This first boat trip to Pixie and Freya. We had cabin with two beds and bathroom which was near to the dog dec and the car dec. It was made easy to travel with the dogs on the boat. Our first stop on the ship was breakfast buffet. This was a pretty ok and they had a lot things to choose from. So you got stomach full and ready for a morning nap. ;) On the ship they have also few gift shops and tax free area were you can buy candy and alcohol. They also have a make up and parfum shop but you must tolerate the strong smells because of the parfum section. Ship also stops in Åland which is a island right by the Finnish border. This is also demilitarized area. This is very nice place to rent a bike and drive around. Freya and Pixie slept most of the trip. We took them to watch a little part of the Swedish archipelago on the dec. Both girls were just fine and trained a little bit with them on the dec. They had a little litter box for the dogs but as I thought both my girls just ignored it. 30 min before we arrived to Stockholm we went back to the car to wait for time we got out of the ship. After that we headed to near by dog park to take the dogs for a walk. This park was only 5 min away from the harbor. Thanks Heidi for the tip!!! Only problem we had was loose dogs that got scent of Freyas heat. Thank god nothing happen but we had some tens moments. Our next destination was Norrköping and Hotel Albatros. It tooks us about two hours to drive. This hotel was really small but they had really nice rooms and super breakfast. 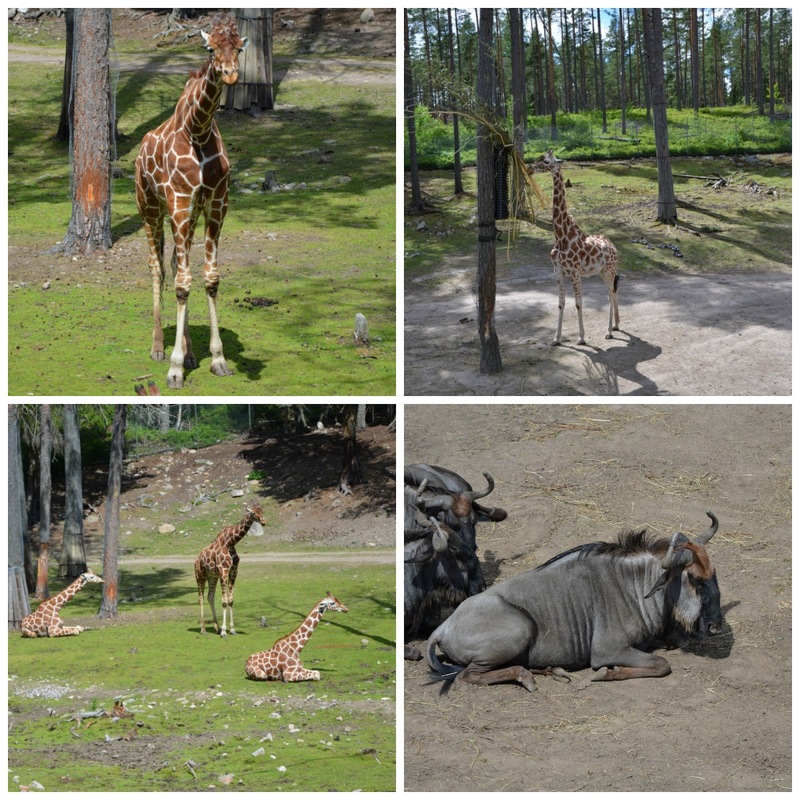 Here we stayed for two nights so that we could visit Kolmården the biggest zoo in Scandinavia. I managed to find nice park and walking routes were I could take the dogs. I also took them to a big grass field to run and train obedience. In Sweden there seems to be a lot nice grass field everywhere. So I just so nice training fields all over. 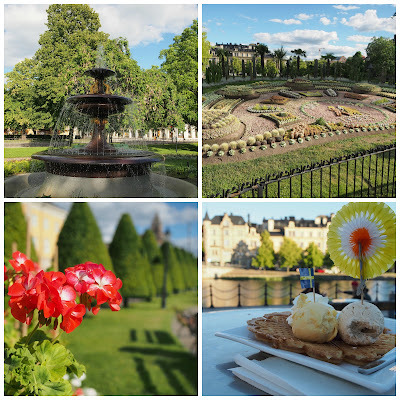 On Tuesday we headed for Kolmården. It took us about 20 min drive from Norrköping. I have been dreaming of visiting this zoo since childhood so it nice to finally be there. From the entrance on the whole park was planed pretty nicely. All the walking ways were covered with concrete so it could have been easy to walk with wheelchair or baby carriage. The park had nice map and program leaflet where you could see all the happenings in the park. Most of the team areas had a show or info made by the caregivers of the animals that lived there. We went first to see a bird show where they showed some predator bird that flied free around the area. The show started with big bird flying from wood straight over the audience. This was amazing! It still gives me goose bumps. This was experiment that almost made me cry. It was just overwhelming. It was so cool the watch how handlers signal birds fly different places and do some tricks. They used ultra sound whistle to signal the birds and they had treat bags on their hips. As a animal trainer this was very interesting to watch. My only thought was how become a trainer like them? It would be amazing to teach people about the animals and living and at the same time show them how the animal move and work. This show is highly recommended to see if you visit Kolmården. Other animals were also interesting to watch. Bears gave the best show in the whole park both in they smaller enclosure and on the Safari trip. Kolmården specialty is the Safari trip where you take a gondola ride over big enclosures where the animals can live pretty freely. There you can see lions, giraffes, antelopes (lost of species), moose and so on. It was nice to see big areas for the animals be in. The gondola didn't seems to bother them at all. Ride has also a story telling the whole way so you could here little facts about the animals and the area they live in the wild. This was available in four languages. Kolmården has also a dolphin and a seal show but this is something I don't want to be a part of. Ocean animals don't belong to the zoo. There is no need to keep them there for conservation. These animals are born to swim long ways and are highly intelligent. We have no reason to keep them in captivity. In the evening we visited the Norrköping city center. We found most amazing food place and some beautiful views of the city. 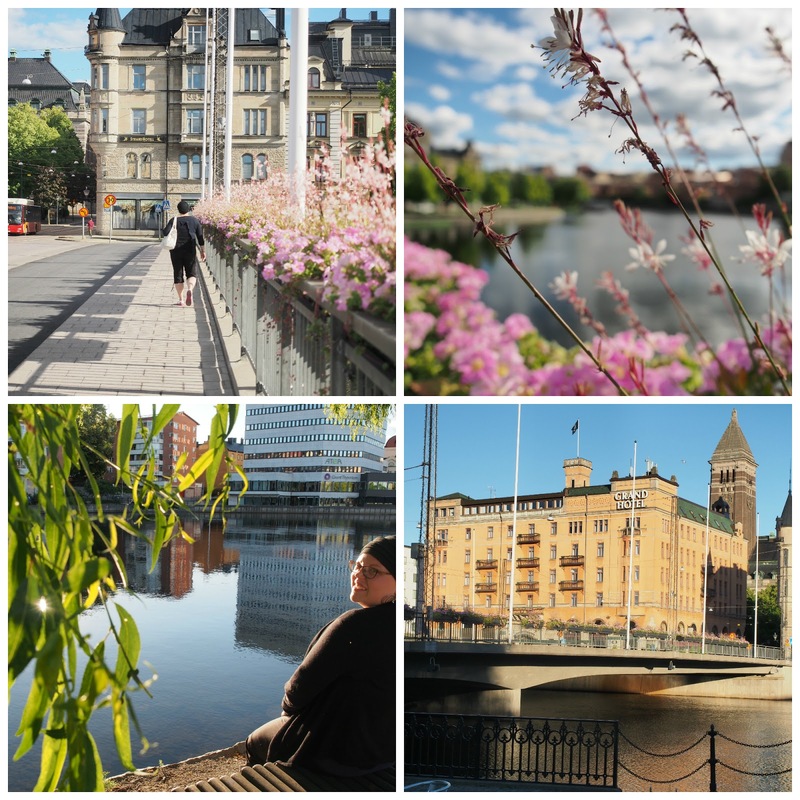 Here are some pics from the Norrköping. That's all for now!! Next part is from our trip Öland and it's nature trails. Tomorrow we will take a ferry Silja Galaxy from Turku to Stocholm Sweden. This trip take us about 11 hours so it will pretty ok for the dogs. The ferry has a little sandbox for dogs but usually dogs don't do they stuff in them. I will take dogs for a long walk in the morning so they will as comfortable as possible during the cruise over the sea. We will have a own cabin during the trip so it should nice from them to just sleep and relax. all vaccination must be in order. 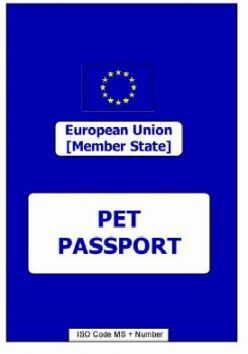 Pet passport, ID-chips and vaccinations you can get from your local vet but be prepare that vaccination have security time from two weeks and up before they are effective. IMPORTANT! Also it good have a worming tablets with you because when you come back to Finland you must have a Echinococcus treatment before coming back. Echinoscoccus is zoonosis that can cause severe infection in humans. At the moment Finland is Echinococcus free and with worming our dogs we can prevent it to coming to the country. Echinococcus can contaminate our blue berries and other forest berries when a dog carrier this worm make feaces to the forest ground. Now we eat blue berries from straight from the forest but if this worm comes every must be boil before eating. So as dog owner you have a BIG responsibility! So tomorrow girls will start they first trip to abroad!!! I can't wait see fly on the grass fields of Dania Cup!!! See you soon! I'm going to update the blog on the way to Denmark. We will visit few places in Sweden before landing to Denmark. 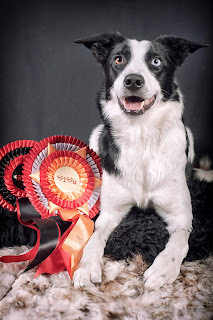 Freya finally got Finnish Agility Championship title! It took us almost 6 months from the day she could have got. We have had some bad luck and have lost it for 4 times. Same goes to our jumping sert but everything comes in time. I'm so proud of her and this year she has really grown to be super competition dog. We have still lot to learn but our team work has grown miles from last year. Freya got her last cert with a nice win in a big competition and on the same day she got her ticket National Championships in Lappeenranta. So she get to go to her first big competion before hit the road to Denmark and Dania Cup. I proud to show this little girl all grown up to her breeder Jane. Both Pixie and Freya took part in National Championships in Lappeenranta. 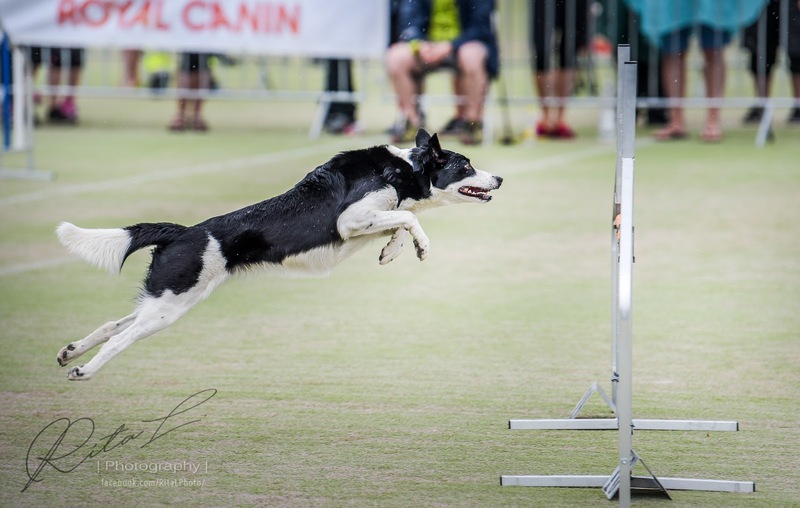 Freya started her work on Saturday by running part of Team Northern Agility Sports. She did a really nice run but missed a pull after dogwalk which made the run a DQ. I was very happy that she worked well even though the place was new and there were more crowd than usually. I don't have any videos from the weekend but cool photos by Rita Larjava. On Sunday we had individual championship. Freya dropped the wall so her run was done with that. We didn't really get back rhythm after that but she had nice parts. Pixie on the other hand took 10th place on the jumping course and ticket to the final. This was one the best runs she had ever made in the Nationals. In the final she dropped the double jump which I waited because it second jump and I had go a really far to next obstacle. I happy with the place in final and how fast she was. Pixie is really ready to rock the agility fields in Dania Cup. Freya will also take part team tryouts next weekend. This will be her first tryouts. I hope that she fly like a wind as she has in the last few competition. I decided to leave Pixie out the try out and rest before trip to the Dania Cup. She has taken part many times in team tryouts but never got in to the second day. One par has always been on our way and to my opinion she is not longer a candidate to bring a medal home from the WC. More and more dogs have running contacts and it gives too much advance in time. Pixie is one the fastest dogs on the ground in Finland but her stopping contacts just puts her out the game. We will see if Freya rise to her level in speed. She has still some tricks to learn but she on her way to be pretty cool agility dog. This fish based food came on at right time. Pixie had just dropped all her hair so I wanted to see how this food with oily fish would help her skin and coat to recover from shedding. Fat in this food is 38 % which pretty high but should be good for skin and coat. Pacific Pilchard is a kibble that has a strong smell of fish to it. So the dog has to like fish. Both Pixie and Freya liked it. Pixie ate it mostly and I could she her skin and coat coming back it self more quickly than usual. I was very pleased how this food was digested. Grain free formula made it also very appealing food to use with my sport dogs. I also liked the idea that used to whole fish in production so there would be no fish material wasted. I could recommend this food to any sport dogs or dogs that have allergies ( this kibble has only sardines as source of meat). Our next big thing is our two week trip Sweden and Denmark. 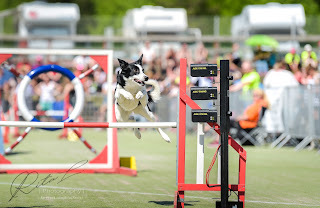 Girls will take part to Dania Cup in Denmark which is week long agility event. This is first time both of them will compete in foreign country. Our trip also Freya puppy meeting so she will meet some of her siblings from all over the world. I just can't wait to meet them!!! I will write about our trip and all the experiences we have on our way. We will start our journey on Monday 3rd July with a cruise ship to Stockholm. I hope you enjoy our traveling blog. I finally got my paw pods and big disc from Fitpaws (order from Rumarakki). I have wanted to get some new toys to make our balance and muscle training more variable. The big disc I have used to do balance tricks but also to relax the back by doing small movements when the dog is lying down on it. I have used this big disc also with a little stool so that the dogs has only front or hind paws on the disc. This way I can concentrate to front or back leg control. Paw pods was the training tool that I waited the most. I knew paw pods would need at least some training before the dog would understand to have one on each pod. Wrong!! Freya got hang of it in like 3 sec. Her ability to handle each of her legs is just amazing. I guess this ability to feel leg movements has helped me on running contact work. It took Pixie a bit longer to hang of it. After that we tried to some high five tricks and back leg lifts as first tasks on paw pods. I have lots different variation in mind how to use these. I hope make cross leg lift even better with these pods. How cool is to train new tricks and at the same time improve my dogs body control. This time my girls got to try Acana Yorkshire Pork (AYP). This is one the new products in the new Acana series. The idea is to have an animal protein from a single animal which makes it an ideal food sensitive dogs that have allergies. AYP has only pork as the animal protein source. It also grain free which makes even more super kibble. My girls both loved the taste of it and I could use it as training reward even for Freya who can be a little picky what she eats. This could be one the good options to use as daily kibble from Acana. I have been working with both girls to get them ready for OB3 which is the highest class in FCI obedience. Both girls have worked on the send to straight which has been a bit of challenge task. Basic are pretty simple but there are just to many distractions to train for example the markings of the stopping circle. I have used a target and toy to get the send straight and with high speed. Freya has has a problem with toy that she starts to make a herding circle so needed to using to toy so much and have very black and white criteria that she needs to run straight. Pixie has learned to keep her head straight forward pretty nicely when I send her to target mat. Next face is to teach her turn stop 180 degrees. We will see how this projects goes. Other new task has been the going around an object followed by a retrieve over a jump. Freya has already started to do the whole chain. Pixie has still some trouble of giving up the jumps. Both girls have pretty nice positions after going around. Freya has still some work with sit but otherwise work has been super. I have split the task in 3 different chains and tasks. 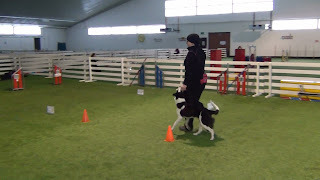 I train the position takes in different situations like going around a tree or after doing an agility tunnel. I train separately the going around part to built it as tight as possible and last have direction retrieve with jump as last part of the chain. This task has been one coolest to train and has lots little things you can make better and better. Just love it! Agility has been a little down mode right now. I have had trouble of remembering courses and really have a good concentration. I have had take a little brake to find out how to set goals that don't make too much pressure to competitions. I have had a lock down in my head and I have tried to open it. Sometimes goal setting can make it difficult to find even a little positive things in your work. I hope we get this solved and start having fun again in competition and I would start remember the courses again. In training we have done mostly running contact which have improved a lot. I have also noticed that Freya would need "a judge" running in training too. She sometimes gets little distracted when judges run next to her. She is sensitive dog and would need more variable training. My fault is that train a lot alone with my dogs so Freya won't get enough distraction training as she would need. Our next goal is to train more course work. I have been very lazy to train course work and we have done just skill improving. So we have to change a little bit how we train to make our work in competition more successful. to clicker training. During my journey I have learned that training techniques can help you to succeed in your goals but there are few fundamental skills that every dog team should learn before starting any sport training. Basic training is sometimes boring but gives you a rock solid base to built on. Basic skills I see important to learn in first year is socialization, calming down, impulse control, motivation and rewarding. All this basic work leads to a good solid relationship and gives basic tools to do anything the team wants. First thing the puppy must learn is to be with its new family. This time should be peaceful time and time to relax from the stress that comes from separating from the mother and the siblings. Little by little the puppy can explore the outside and see new things but safely. It is important to observe the puppies character and see how much new things it can handle. This is time to teach the puppy recalls and walking on leash. Puppy should also meet safe adult dogs and other puppies of same age and size. Also taking the puppy to new environment is important so it learns different surfaces, smells, sound, traffic, meeting different dressed (man wearing a hat, big coat etc.) and moving people (wheelchair, babies, old) etc. All this need to be done in the puppies terms. Shyer puppy might handle few short visits to new places per weeks and more bold puppy can visit new places more often. You just need to watch your puppies reactions and how recovers from the stress. Calming down is skill that can be the hardest teach at first but pays off in a long run. It means that you teach your dog a routine that leads to calm lying down. First you train this at home. First time might take 15-30 min if you have already a older puppy. Make sure you have something calm to do like watching a TV show. You can use a mat as spot to lying down so that you can take it with anywhere and it can be save spot for the dog in the future. You can have collar or harness to help the keep the dog close to you and then you start making long strokes from head to the end of hind leg. Remember you need calm down too. In this exercise you don't need treat the dog. Dog just need to learn calm down. At first time exercise end when the dogs has calmed down in lying down position. Dog will start calming down faster and faster as practice this routine. Then you can go and try this same routine in new more busier place. This can lead to longer calming down time but more work on it more faster it gets and the dogs learn to take it relax stage in anywhere. In longer run this helps reduce stress in new places and competition trips. Motivation can be from internal like hunger, thirst and reproductive needs or it could from outside smell, social interaction, car ( takes to forest run), ball (change for game). Every behavior have some kind of motivational drive. Every time you train and your dog does something out of the ordinary you should think what motivated to do it. Finding our the motivation to each behavior can be the key to solve it or route to find away to train for your liking. Behavior has always reason why it happens. Dogs don't have ability to be nasty or try to trick us. We just have see what motivates them to do it differently or have we have our training lead to the seen outcome. In training we need different things to make the dog work for us. Usually we use rewards like toys, treat, social reward or environmental rewards ( like permission to play with other dogs). The most important thing is that THE DOG get choose what is rewarding and what is not. Playing can mean a lot things to different dogs. One might want to chase something or chew the toy or just do the tugging. In the end its the dog choice and as handler it is our job to find out which things our dogs like. Some dogs like treat but you give them in many ways to make it more interesting: like chasing treat hand, tossed treat, treat ball etc. You can also built up value to toys or treats with using the preferable reward to enhance to the other. Treating games can be built but always watch how you dog reacts and does it really feel that reward is rewarding. Some dog might like tugging but other might feel most rewarded when they can run around with toy in their mouth. It is important to find things that your dog thinks is valuable. This gives you motivation tool to teach the dog to things you like. Different situations might need different rewards. At home your dog might work for a kibble and in the busy dog training arena you might need treat likes chicken heart to get as good as motivation to work with you. More games you teach more tools you have in the future. I try to teach my dog to play with anything from piece of grass to fallen leaf in the autumn. I want the any surroundings to be a change to play with me. Impulse control is one the most important skills when it comes to dogs sports. The dog need to learn to give up from distractions and give the attention to the handler. Basic exercise is given up the treat. This is one the first trick I teach puppies when they been at the house for awhile. First you have treat in your hand and when the dog tries to get it you close hand as soon as the dog moves away from the treat hand you treat the dog with your other hand. This trick advances to a stage where the dog takes an eye contact to get the treat. Later on you can play with the open treat hand near the dog and it needs keep the eye contact to you. This is same thing you can do with food bowl. Dog need to sit and give eye contact before it gets cue to get the food. This kind of work helps the dog to built up self control. Next game can be done with a toy. If dog tugs well, you can do impulse control game. You start with playing with the dog and then you stop playing and freeze your hands. At this point you wait that dogs lets go of the toy and takes default position. Then you move the toy a bit and if the dog hold its ground you give it release cue to start tugging again. First time you do can release the dog to play as soon as it gives up toy and then increase the distraction. Before you do this it good have done tugging games so that you dogs feel confident and has good drive to play with you. Remember to let the dog win the toy a lot to built up a strong playing mode with you. Some manuals say not let the dog win but that isn't right. Winning helps the dog built confidence and playing drive, also it gives the dog reason keep playing with you because it can win and feel awesome. Impulse control games are just part the game and gives playing some rules. That my thoughts for today!!! Freya has been working on the tasks in OB4. It has been so much fun. First we started to work on the box task. Freya needed to learn to run straight to emptiness. I started to work on it with a foot target which I moved to different locations and distances. My goal was to make learn to focus her work straight forward and also to go as long I stopped her with cue or she reached the target mat. I also teach her to go straight to nose touch to wall. This training was to help her handle the situation where she need to run against a wall in small competition. So far my plan has worked out really well and she super focus when we do the forward sends. Time will tell what challenges are ahead. First will the markings on the ground. This will be our first distraction challenge. I have done the running part separate from sending forward. I have put Freya straight in front of me and starting send to left and right to the box. Freya has finally got the idea of running in the middle of the box. She has been super. Her speed and accuracy has improved million times. It has so fun the work with her. Next is to back chain the two part together. She has learn this little change to the task really fast. This task has been my favorite ever! So many little things to train. I have mostly trained the positions in the wood by going around the trees then I get easily few repeats with nice brakes. Having brakes between positions stops usually gives more quality to the work. Freya can to max of three super good stops. So if I want to keep them super I need train them as less as possible in one session. Other part has been the retrieve with the jump. First we have worked on retrieve part. Freya needed to learn to lift the dumbbell from down to up. She usually has pushed to dumbbell little on to the ground first and then picked it up. This created a problem that the jump came to fast to her and it didn’t look good enough. We started to work this problem by putting the dumbbell to little stool which she had to picked from to retrieve. It took only few tries and Freya started to change way she took the dumbbell to her mouth. I took this helped retrieve behind a jump from where we started work on rest on chain. Freya improved work superbly. I think we going to a right direction with this. Next step is to try all these chains together so little backchaining work ahead. We have been working her technique a lot to make even better. I have done some body balance training and also work with the back legs. I have tried to improve the control in her body. It has started to pay off and she has done super work. I have done technique from close up from 5 m and then 1st changes from 20 m or more. So I’m trying to work the distance and control in separately. So far so good. I have also used a mat to get her better sense to keep her hind legs still. There are so many little things you can improve at the same time to work your way to the end goal. Years I have make me better at braking skills apart to make awesome together. We have still long way WC level work but it fun to try improve even the little things in our distance control. Recall has also a lot of element that need to be trained separately. Stops can be work on walks and also high speed recalls. Then we have try to make stops more interesting with recall game with two people where the dogs runs back and forward between two persons. Then you can make stop and give backround reward behind the dog. This little game has helped to make the stops even better. We usually do about 4-6 runs or less. This game is also a very demanding physically so better keep the repeats low to get high quality performances. More is less! 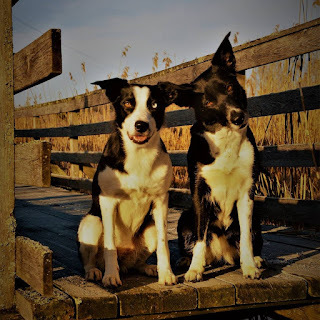 Here you can read about my dogs and what we have done. I will also try to open my training methods as much as I can. Training dogs is the most suberb thing in the world and you can't ever learn all. Marianne_A. Simple theme. Powered by Blogger.